While most of us might not see the benefit of new wars and military action across the planet, or the rise of the surveillance state to track our every move; if you are a defense contractor – times couldn’t be better. 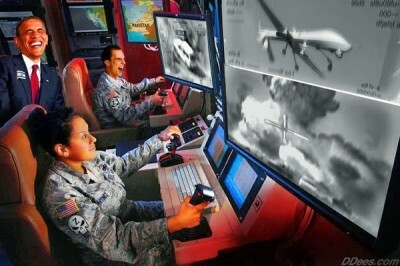 After struggling with Congress, as detailed in the video report below, mega war profiteer defense contractor Northrop Grumman has won the day by receiving a new $354 million contract for its much-maligned Global Hawk spy drone. Its initial projected cost was $35 million each in 2005, but ballooned to $222 million by 2013. They’ve now settled on providing 3 new Global Hawks for $354 million, expanding to 37 total surveillance drones. There seems to be no mention of how this latest cost was reduced from previous estimates. But when one considers that Northrop spent $20.6 million lobbying Congress in 2013 – the most among defense contractors – the return on investment is solid. The new aircraft will be capable of carrying sophisticated imaging and electronic signal sensors, which can collect multiple types of intelligence from high altitudes for up to 32 hours … to provide field commanders with high-resolution, near real-time imagery of large geographic areas in support of military, humanitarian and environmental missions. As the main street U.S. economy continues its downward spiral into Third World status, prompting talk of forced austerity, it’s nice to know that there is always an extra $350 mil in reserve to keep the global drone arms race well funded and prosperous. It has a wingspan of 131 feet, a range of 8,700 miles, a crew of zero people, and the U.S. Defense Department wants a lot more of them. It’s the Global Hawk Drone, developed by Northrop Grumman, and it’s currently the largest unmanned aircraft in the world. But for all their uses, these drones are expensive: In 2013, each one cost $222 million, up from a $35 million estimate in 2005. The sixfold price increase set off a bitter fight in Washington, with many claiming the drone was both more expensive and less effective than the manned U-2 plane, which made its first flight in 1955 and are made by rival firm Lockheed Martin. But if that sounds like a problem to you, you probably don’t work at Northrop Grumman, which haslobbied Congress harder than anyone to keep its Global Hawks soaring. And so far it seems to be working. The Center for Public Integrity reports a 2013 attempt to mothball the plane was aborted over the wishes of the Air Force Brass by Congress. The Air Force seems to have gotten the message. In September, it awarded Northrop a $354 million contract to expand the fleet to 37 planes. Which means, for better or for worse, the Global Hawks will be soaring above other countries for decades to come.